alaTest has collected and analyzed 122 reviews of Toshiba Camileo P30. The average rating for this product is 3.6/5, compared to an average rating of 4.0/5 for other Camcorders for all reviews. Reviewers are impressed by the design and price. The size and usability also get good feedback, whereas there are some mixed opinions about the image quality. The viewfinder and color get less positive reviews. We analyzed user and expert ratings, product age and more factors. Compared to other Camcorders the Toshiba Camileo P30 is awarded an overall alaScore™ of 82/100 = Very good quality. 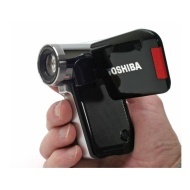 alaTest has collected and analyzed 33 user reviews of Toshiba Camileo P30 from Amazon.co.uk. The average user rating for this product is 3.3/5, compared to an average user rating of 4.0/5 for other Camcorders on Amazon.co.uk. Reviewers really like the design and price. The size and portability are also appreciated. There are some less positive comments about the viewfinder and color. The diminutive Camileo P30 offers Full HD shooting for under £150. Is there a catch? It could be a bit more rugged, but the compact P30 delivers good video quality at an attractive price. Image quality only good in extremely good lighting conditions otherwise, very very poor. Not sure why this product has HD attached to it. Very compact easy to use and can fit in a small handbag. low light picture is poor but then you cant have a big lens on a tiny camcorder!!!! The camcorder is very easy to use, lightweight and compact and looks appealing. The design of it makes it easier to hold than most camcorders and filming is quite good. Taking photos of faces in dimmed light sometimes come out grainy but there is a light that can be used so that may improve quality. Otherwise I have no complaints.